Naumati Baja (literally – Nine musical instruments) is a group of nine traditional musical instruments played in Nepal and Himalayan region of Sikkim, Darjeeling and Assam during certain auspicious occasions like marriages. Naumati is more comprehensive form of the Panchai Baaja. 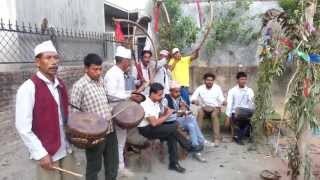 Panchai Baaja (or a band of five instruments) has been played since olden times as a good luck to any auspicious performances. There is a reference in the scriptures that Panchai Baaja was played in the Dwapar Yug on the auspicious occasion of the Christening Ceremony of the Lord Krishna. The Panchai Baaja represents the five metals and while designing these instruments, the images of five deities viz; Ganesh, Bishnu, Shiva, Goddess and Sun were kept as the background. This set of five instruments later was modified into Naumati Baaja with nine or even more instruments to play. This set of instruments is also known as Panchai Baja (set of five musical instruments) and is very popular in Nepal.